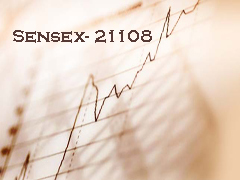 Sensex will reach 21,108 in 2012 ? Home » Stock Market » Sensex will reach 21,108 in 2012 ? The confidence is slowly coming back. We see equity market is moving upwards slowly. So, question again arises that will Sensex reach to 21,108 again from current level of 17,700. During the special Diwali trading session on Friday, Nov 5, 2010, BSE Sensex has touched all-time high 21,108 level but in 2011, the Bombay Stock Exchange (BSE) Sensex fell 25 per cent, or 5,054 points, to 15,454. In 2012, it rose 19.2 per cent, or 2,974 points, to 18,428 from the beginning of the year till 21 February. However, it slipped 5.3 per cent in the last seven trading sessions of February and was at 17,584 on 1 March 2012. So rise and fall in market is continuing but looking at past few trading session what do you think upward trend in market will continue and can we see new level of 21,000. Let’s check out. Although there are many difficulties and ifs and buts on the way of market including Eurozone, variation in crude price, slow down etc. but now it seems that dark clouds of indecision are disappearing and we will have good rain of money in market. At present juncture we are of the opinion that rise in equity market will continue. Many company stocks are available at attractive price. SEBI is trying to get reform in market by making change in IPO and mutual funds norms. If finance ministry also helps market by giving positive boost it will defiantly be fresh life to equity market. Let us look at the major factors which can give direction to the stock market in 2012. Foreign Institutional investor activities make major impact on deciding market direction for Indian stock market. If we check out FII activity year so far since January, 2012 then FIIs had made a net investment of Rs 57,958 crore in past eight months (till Aug,2012). If we compare this data with previous year 2011 than in previous year FII had taken 2714 crore from Indian stock market. So FII is continuously pumping money in Indian stock market from last eight months which is good indication for market. Food inflation started moderating due to various steps taken by RBI. Rate cut CRR medication cause variation in interest rate & inflation. If we look at inflation rate it was 9.47% in 2011, which has drop down to near about 6.95% in 2012. Rising inflation can hurt stocks badly. Investors hate jumps in inflation because they sharply raise the levels of uncertainty about consumption, savings and investments. Thing is that inflation should reduce further or should maintain level. Crude price rise is other factor which affects market movements. We have seen that crude price has jumped above 100$ per barrel many time. This rising crude price adversely affects our country’s finances & cause inflation. This rising crude oil prices can also impact automobile, manufacturing and heavy industries sectors. The market has already witnessed a huge correction in 2011. Therefore, 2012 will be a year of better growth and performance despite shocks on the oil front. Currency can play major role in giving direction to India’s stock markets. Rupee was at 50 Rs/- to dollar but recent steep rise in cost to 55 Rs/- is big reason to worry. But higher inflow by FII may strengthen the rupee. “Market has bottom out. The Sensex can touch 20,000 levels in 2012”. We strongly advise clients to stay invested. Do not get panic by short term falls or by market volatility. Falls in the market should be used to buy good quality stocks. High quality management and strong business models with good visibility and strong cash flows should be looked at for investing. Looking at current movement market may reach 21,108 again. We will bring you the latest updates on the same as they happen. Stay tuned to Strategic Growth by following Strategic Growth Official Facebook Page and sign up for our free newsletter.